From the Montreal Neurological Institute (M.G., A.R., R.L., P.S.G., J.A., A.B.-O. ), McGill University, Montreal, QC, Canada; Brain and Mind Centre (M.G. ), University of Sydney, NSW, Australia; Institute of Actuaries of Australia (A.E. ); Department of Neurology (F.L., F.Z. ), University Medical Center Mainz, Germany; and Department of Neurology (A.R., R.L., A.B.-O. ), Perelman School of Medicine, University of Pennsylvania, Philadelphia. Objective: To examine the mechanism underlying the preferential CD8+ vs CD4+ T-cell lymphopenia induced by dimethyl fumarate (DMF) treatment of MS.
Methods: Total lymphocyte counts and comprehensive T-cell subset analyses were performed in high-quality samples obtained from patients with MS prior to and serially following DMF treatment initiation. Random coefficient mixed-effects analysis was used to model the trajectory of T-cell subset losses in vivo. Survival and apoptosis of distinct T-cell subsets were assessed following in vitro exposure to DMF. 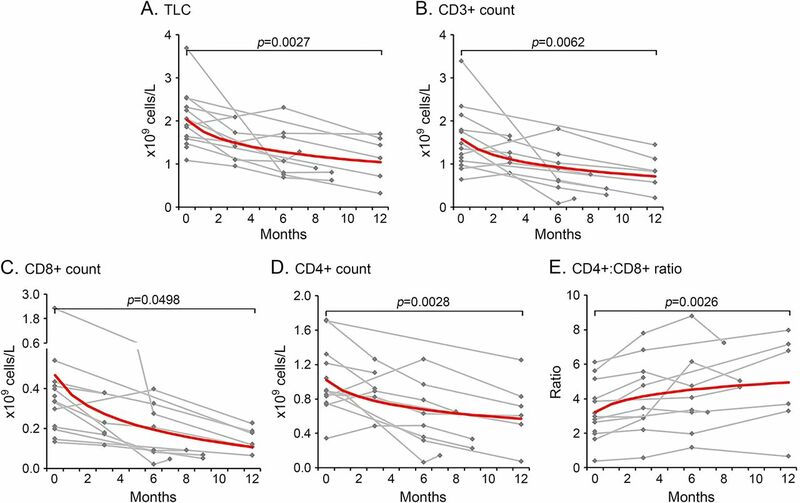 Results: Best-fit modeling indicated that the DMF-induced preferential reductions in CD8+ vs CD4+ T-cell counts nonetheless followed similar depletion kinetics, suggesting a similar rather than distinct mechanism involved in losses of both the CD8+ and CD4+ T cells. In vitro, DMF exposure resulted in dose-dependent reductions in T-cell survival, which were found to reflect apoptotic cell death. This DMF-induced apoptosis was greater for CD8+ vs CD4+, as well as for memory vs naive, and conventional vs regulatory T-cell subsets, a pattern which mirrored preferential T-cell subset losses that we observed during in vivo treatment of patients. Conclusions: Differential apoptosis mediated by DMF may underlie the preferential lymphopenia of distinct T-cell subsets, including CD8+ and memory T-cell subsets, seen in treated patients with MS. This differential susceptibility of distinct T-cell subsets to DMF-induced apoptosis may contribute to both the safety and efficacy profiles of DMF in patients with MS.
Dimethyl fumarate (DMF; Tecfidera, Biogen, Weston, MA) is an oral fumaric acid ester (FAE) which has been shown to reduce clinical relapses and MRI measures of inflammatory disease activity in relapsing-remitting MS (RRMS).1,2 The mechanism/s underlying the ability of DMF to reduce inflammatory disease in MS remains incompletely elucidated, although both cytoprotective and immunomodulatory actions of DMF and its major metabolite, monomethyl fumarate (MMF), have been postulated3,–,11 (reviewed in references 12, 13). Mechanisms underlying DMF-induced lyphopenia remain incompletely elucidated. Important questions include whether distinct mechanisms explain differential CD8+ vs CD4+ T-cell subset losses, and how cell subsets with specific immunologic roles are affected by DMF. A greater understanding of these issues will aid safer treatment decisions and monitoring of DMF use in patients. Here, using a combination of in vivo and in vitro approaches, we investigated the mechanism underlying the preferential losses of CD8+ vs CD4+ T cells induced by DMF treatment in patients with MS.
Thirteen patients (11 women and 2 men) with RRMS and a mean age of 41 years (range 20–60 years) were prospectively followed at a single center in Montreal, Canada, prior to and following treatment initiation with DMF. Patients were assessed every 3 months with clinical review, physical examination and Expanded Disability Status Score (EDSS), and blood procurement with isolation of peripheral blood mononuclear cells (PBMC) when possible. At study entry, patients had an average EDSS of 2.5 (range 1.0–4.0), preceding annualized relapse rate of 0.8 (0–2) and disease duration of 9.6 years (range 1–27 years). Eleven of the 13 patients had previously been treated with either interferon or glatiramer acetate, 1 had received a single dose of ofatumumab 18 months prior to recruitment, and 1 was treatment naive. Ten healthy controls were recruited for in vitro studies. Blood sample processing and cell culture. Complete blood counts including TLC were performed by a certified clinical laboratory. T-cell subset absolute counts were estimated using the clinical laboratory TLC results and flow cytometry gating of individual subsets within the total lymphocyte populations. High-quality PBMC were separated by density centrifugation using Ficoll (GE Healthcare, Little Chalfont, UK), and a portion was cryopreserved using strict standard operating procedures for all phases of sample procurement, processing, freezing, storage, and subsequent thawing. Where indicated, magnetic bead sorting (Miltenyi Biotec, Bergisch Gladbach, Germany) was used to negatively select CD3+ T cells from freshly isolated or thawed PBMC with purities of typically >94% as confirmed by flow cytometry. For measurement of FAE-induced apoptosis, freshly isolated PBMC and T cells were cultured in serum-free X-vivo 10 medium (Lonza, Basel, Switzerland) at 3 × 105 cells/well in 24-well plates for 3 days. Cell cultures were treated with medium alone, vehicle (dimethyl sulfoxide [DMSO]), MMF, or DMF (Sigma-Aldrich, Oakville, ON, Canada). MMF and DMF were added to individual wells across a concentration range (10, 25, or 50 μM), with DMSO control added at the highest (50 μM) equivalent concentration. Given the short half-life of DMF,20 a second identical dose of DMF, MMF, or vehicle was added to each well after a 60-minute incubation. For dexamethasone-induced apoptosis assays, T cells purified from thawed patient PBMC samples were cultured at 105 cells/well in 96-well plates for 3 days with the addition of medium alone, dexamethasone (Sigma-Aldrich) at concentrations between 3.125 × 106 M and 5 × 105 M, or equivalent vehicle (ethanol) concentrations. Antibodies to phenotype T-cell subsets were directed against CD3 (BD Biosciences and Biolegend, San Diego, CA), CD4, CD8, CCR7, CD45RO, CD45RA, CD25, CD31, CLA, and CCR4 (BD Biosciences), CD127 (Beckman Coulter, Brea, CA), Integrin β7, CCR9, CCR5, and CCR2 (Biolegend). Antibodies to detect intracellular targets were directed against IL-22 (eBioscience, San Diego, CA), IL-4, IL-10, IL-17, IFNγ, GM-CSF, and FOXP3 (BD Biosciences), BIM, BAK, and BCL-XL (Cell Signaling Technology, Danvers, MA), BAX and BCL-2 (Biolegend), and PUMA (Abcam, Cambridge, UK). For apoptosis assays, cells were stained with Annexin V and propidium iodide (PI; BD Biosciences) following the cell surface staining. Staining combinations and reagent details are provided in table e-1 at Neurology.org/nn. Counting beads (CountBright; Thermo Fischer Scientific, Waltham, MA) were added to obtain cell counts for T-cell survival assays, and samples were analyzed immediately using flow cytometry. For intracellular cytokine staining, phorbol 12-myristate 13-acetate (20 ng/mL; Sigma-Aldrich, St. Louis, MO), ionomycin (1 μg/mL; Sigma-Aldrich), and GolgiStop (Monensin; BD Biosciences) were added 4 hours prior to staining. Cells were processed and stained as previously described21 and according to the manufacturer's recommendations (BD Biosciences and eBioscience). Cells were analyzed using an LSRFortessa Flow cytometer (BD Biosciences) and FlowJo software (Tree Star Inc., Ashland, OR). A representative example of T-cell staining and the flow cytometry gating strategy is provided in figure e-1. For analysis of longitudinal data from serially sampled patients with MS, we used a random coefficient mixed-effects analysis (SAS Software, Cary, NC), allowing efficient utilization of repeated measures data and modeling of treatment-related changes (fixed effects), while also accounting for between-patient variability (random effects).22 We used the Akaike Information Criterion (AIC) to compare the performance of 3 candidate models for the trajectories of immune cell subset losses following treatment initiation: a 12-month linear decay model (in which changes occurred uniformly over the 12-month follow-up); an exponential decay model (in which 75% of changes occurred in the first 6 months of treatment); and a 6-month linear decay model (in which 100% of changes occurred in the first 6 months of treatment, with no changes thereafter). For in vitro studies, a 2-way repeated measures analysis of variance (RM ANOVA) with Dunnett multiple comparisons test was used to compare the effects of different DMF and MMF doses across distinct T-cell subsets. Relative changes in cell viability were corrected for the differing basal viability in culture of each cell subset using the viability of the untreated condition (i.e., relative change in viability for subset A with DMF exposure = (%viability subset ADMF-exposed − %viability subset AUntreated)/%viability subset AUntreated). One-way RM ANOVA with Sidak multiple comparisons tests were used to compare a single DMF dose between 3 or more T-cell subsets, and paired t tests were used for the same analyses when only 2 T-cell subsets were compared. One-way RM ANOVA or paired t tests were used for all other pre- vs post-treatment comparisons. p Values, adjusted for multiple comparisons, of ≤0.05 were considered statistically significant. Analyses were performed using Prism 7 (GraphPad Software, La Jolla, CA). The study was approved by the Institutional Review Board of McGill University. All participants provided written informed consent. In vivo kinetics of DMF-induced lymphopenia and early preferential loss of CD8+ cells in patients with MS.
We considered whether assessing the trajectories of T-cell subset losses, based on serial sampling of DMF-treated patients with MS and a random coefficient mixed-effects analysis, would provide clues into the mechanism/s underlying the previously reported14,–,16 differential effect of treatment on CD8+ vs CD4+ T-cell subsets. Comparing the performance of the 3 candidate models tested using the AIC, we found that the exponential decay model (in which 75% of changes occur in the first 6 months of treatment) was best fit in 72% of T-cell trajectories tested. The second best performing model (best fit in only 22% of cases) was the 6-month linear decay model. The superiority of the exponential model and the 6-month linear decay model over the 12-month linear decay model in 94% of cases indicates that the majority (between 75% and 100%) of T-cell losses are occurring in the first 6 months of treatment. For simplicity, we used the best performing exponential decay model for all subsequent analyses. By 12 months, TLCs decreased by an average of 48%, from 2.02 × 109 cells/L pretreatment to 1.04 × 109 cells/L at 12 months (p = 0.0027; figure 1A), with total CD3+ T-cell counts decreasing by an average of 54% (p = 0.0062; figure 1B). Within the CD3+ T-cell population, CD8+ counts decreased from an average of 0.47 × 109 cells/L pretreatment to 0.11 × 109 cells/L at 12 months, representing a 77% decrease (p = 0.0498; figure 1C), whereas CD4+ counts decreased by only 44%, from 1.02 to 0.57 × 109 cells/L (p = 0.0028; figure 1D), leading to an increase in the CD4:CD8 ratios from 3.2 pretreatment to 4.9 by month 12 (p = 0.0026; figure 1E). Our results suggested that although the magnitude of DMF-induced T-cell loss was greater for the CD8+ T cells than CD4+ T cells (as previously reported14,–,16), the similar trajectories of decreased counts are compatible with a common mechanism underlying losses of both cell subsets. TLCs (A), CD3+ (B), CD8+ (C), and CD4+ (D) counts all decreased on DMF treatment. The greater relative decrease in CD8+ vs CD4+ T cells on DMF treatment resulted in an increase in the CD4+:CD8+ ratio (E). Data shown are from patients with MS (n = 13) pretreatment (month 0) and up to 12 months following DMF treatment initiation. The p values displayed represent the statistical significance of the exponential decay trajectory (shown in red) in a random coefficient mixed-effects model. Individual patient trajectories are shown in gray. DMF = dimethyl fumarate; TLC = total lymphocyte count. DMF induces direct T-cell apoptosis in vitro, with differential effects on CD8+ compared with CD4+ T cells. Examination of the in vitro effects of DMF and MMF on T-cell survival within PBMC revealed that exposure to DMF, but not MMF, caused dose-dependent decreases in survival of CD3+ T cells, including both CD8+ and CD4+ T cells (figure 2A). This dose-dependent decreased survival reflected apoptotic cell death (figure 2B), such that the frequency of apoptotic (Annexin V+/PI+) CD3+ cells was 9.8% with vehicle alone, vs 19.5% for DMF 10 μM; 43.3% for DMF 25 μM; and 60.4% for DMF 50 μM (all p = 0.0001). Mirroring the preferential losses of CD8+ vs CD4+ T cells that we observed in treated patients, the in vitro apoptotic cell death was approximately twice as marked for CD8+ T cells compared with CD4+ T cells. For example, at the DMF 25 μM exposure, the decrease in cell viability (relative to the untreated condition) was 52% for CD8+ T cells vs 25% for CD4+ T cells (p = 0.0001; figure 2C). A representative example of Annexin V/PI staining of CD8+ and CD4+ T-cell subsets under each condition is provided in figure e-2. Because DMF is known to affect survival and function of myeloid cells, we sought to distinguish a direct pro-apoptotic effect of DMF on T cells from an indirect effect through supporting myeloid cells within the PBMC. We repeated the above experiments on purified CD3+ T cells and observed the same dose-dependent pattern of DMF-induced apoptosis among total CD3+ T cells and the preferential loss of CD8+ compared with CD4+ T cells (figure 2D). Healthy control (n = 10) PBMC were cultured with the addition of DMF, MMF, vehicle alone, or medium alone. Total CD3+, CD4+, and CD8+ T-cell subsets showed a dose-dependent decrease in survival after the addition of DMF, whereas MMF and vehicle alone had no effect (A). The proportion of apoptotic cells within CD3+, CD4+, and CD8+ subsets increased with increasing DMF exposure (B). Relative to viability in untreated cultures, there was significantly greater DMF-induced loss of viability among CD8+ vs CD4+ T cells following a 25μM DMF exposure (C). The pattern of DMF-induced apoptosis of CD3+, CD4+, and CD8+ T cells was also seen in purified T-cell cultures (n = 4) (D). Statistical analyses used were a 2-way repeated measures ANOVA with adjustment for multiple comparisons using Dunnett test (A, B, and D) and a paired t test (C). ANOVA = analysis of variance; DMF = dimethyl fumarate; MMF = monomethyl fumarate; PBMC = peripheral blood mononuclear cells; UnTx = untreated; Veh = vehicle alone. Memory T cells exhibit greater susceptibility to DMF-induced apoptosis in vitro. To assess the relative susceptibility of distinct subsets of CD4+ and CD8+ T cells to DMF-induced apoptosis, staining with CD45RA and CCR7 was used to distinguish CD4+- and CD8+-naive T cells (TN; CD45RA+CCR7+), central memory (TCM; CD45RA−CCR7+), and effector memory (TEM; CD45RA−CCR7−) T cells, as well as terminally differentiated effector memory (TEMRA; CD45RA+CCR7−) CD8+ cells within PBMC. Although all subsets within both CD8+ and CD4+ T cells exhibited a degree of dose-dependent DMF-induced apoptosis (and no effect of MMF) (figure 3, A and B), decreased viability was more pronounced for the memory compared with the naive T-cell subsets. Among CD8+ T cells exposed to 25 μM DMF, decreased viability was least pronounced for TN (−10%), compared with all memory subsets including TCM (−63%, p < 0.0001), TEM (−70%, p < 0.0001), and TEMRA (−54%, p = 0.0003) (figure 3C). Similarly, the decrease in CD4+ T-cell viability following 25 μM DMF exposure was least among TN (−15%) compared with both TCM (−30%, p = 0.0269) and TEM (−41%, p = 0.0013) subsets (figure 3D). The same differential effects on memory and naive T-cell subsets were seen in experiments using purified T cells alone (data not shown). 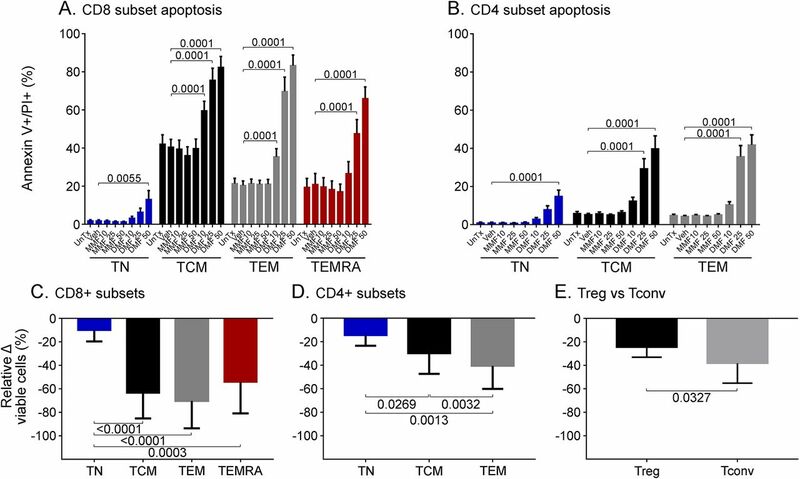 Across the same concentration range of DMF, regulatory T cells (defined as CD4+CD25 hiCD127low Tregs) exhibited lesser susceptibility to DMF-mediated apoptosis compared with conventional (CD4+CD25−) T cells, most notably at the higher DMF concentration (figure 3E). Healthy control (n = 10) peripheral blood mononuclear cells were cultured with the addition of DMF, MMF, vehicle alone, or medium alone. All CD8+ (A) and CD4+ (B) naive and memory subsets underwent a degree of DMF-induced apoptosis, whereas MMF and vehicle alone had no effect. Relative to viability in untreated cultures, there was significantly greater DMF-induced loss of cell viability among memory vs naive CD8+ (C) and CD4+ T cells (D) following a 25μM DMF exposure, as well as among conventional vs regulatory CD4+ T cells following a 50μM DMF exposure (E). Statistical analyses used were repeated measures 2-way ANOVA with adjustment for multiple comparisons using Dunnett test (A and B), repeated measures 1-way ANOVA with Sidak multiple comparisons test (C and D), and a paired t test (E). ANOVA = analysis of variance; DMF = dimethyl fumarate; MMF = monomethyl fumarate; TCM = central memory T-cells; Tconv = conventional T-cells; TEM = effector memory T-cells; TEMRA = terminally differentiated effector memory T-cells; TN = naïve T-cells; Treg = regulatory T-cells; UnTx = untreated; Veh = vehicle alone. The in vivo pattern of distinct T-cell subset losses in DMF-treated patients with MS recapitulates their preferential in vitro susceptibility to DMF-mediated apoptosis. We next observed that the in vitro patterns of DMF-mediated apoptosis in distinct T-cell subsets were recapitulated during in vivo DMF treatment of patients with MS, which induced greater losses of memory T-cell subsets compared with naive T cells, leading to preferential decreases in frequencies of circulating TCM and TEM subsets (and relative increases in the frequencies of TN cells) within both the CD8+ and CD4+ T-cell pools (figure 4, A–F). Examination of the kinetics of CD4+ recent thymic emigrants (RTEs; CD31+CD45RO−) emerging into the circulation of DMF-treated patients revealed that although RTE frequencies increased during treatment (figure 5A), their absolute counts remained relatively stable (figure 5B). In vivo treatment also resulted in decreased frequencies of the effector (Teff) CD4+IFNγ+ (Th1) T cells (figure 5C) and CD8+IFNγ+ (Tc1) T cells (figure 5D), in the face of lesser decreases in frequencies of T cells with regulatory phenotype (CD4+CD25 hiCD127low Tregs; figure 5E), recapitulating the relative resistance of Tregs to the DMF-mediated apoptosis observed in vitro. Although DMF treatment of patients thus generally resulted in decreased absolute counts of T-cell subsets, the differential losses of these subsets in DMF-treated patients resulted in increased ratios of putatively anti-inflammatory subsets to putatively proinflammatory subsets (figure e-3). For all T-cell subsets examined, the majority of in vivo changes occurred within the first 6 months of DMF treatment, again consistent with best-fit exponential decay trajectories. Among CD8+ T-cell subsets, central memory (A) and effector memory (B) populations decreased in frequency, whereas naive cells increased in frequency (C) with DMF treatment. This pattern was mirrored within the CD4+ T-cell pool: central memory (D) and effector memory (E) frequencies decreased, whereas a reciprocal increase in naive T-cell frequencies (F) was seen. Data shown are from patients with MS (n = 13) pretreatment (month 0) and up to 12 months following DMF treatment initiation. The p values displayed represent the statistical significance of the exponential decay trajectory (shown in red) in a random coefficient mixed-effects model. Individual patient trajectories are shown in gray. DMF = dimethyl fumarate; TCM = central memory T cell; TEM = effector memory T cell; TN = naive T cell. DMF treatment resulted in an increased frequency of circulating RTEs (A), although absolute counts of RTEs did not change (B). Proinflammatory IFNγ–expressing Th1 (C) and Tc1 (D) populations decreased in frequency with DMF treatment, whereas regulatory T-cell frequency remained relatively stable (E). Data shown are from patients with MS (n = 13) pretreatment (month 0) and up to 12 months following DMF treatment initiation. The p values displayed represent the statistical significance of the exponential decay trajectory (shown in red) in a random coefficient mixed-effects model. Individual patient trajectories are shown in gray. DMF = dimethyl fumarate; RTE = recent thymic emigrant; Treg = regulatory T cell. Using a combination of in vivo and in vitro approaches, our present study explored potential mechanisms underlying the preferential losses of CD8+ vs CD4+ T cells observed in DMF-treated patients. We applied a random coefficient mixed-effects model that incorporated serial data collected over the 12-month study period, enabling us to assess the kinetics of cell subset losses in individual patients. The best-fit model for both CD4+ and CD8+ T-cell subsets involved the majority of losses (>75%) occurring during the first 6 months of treatment, with lesser ongoing losses continuing to occur thereafter. 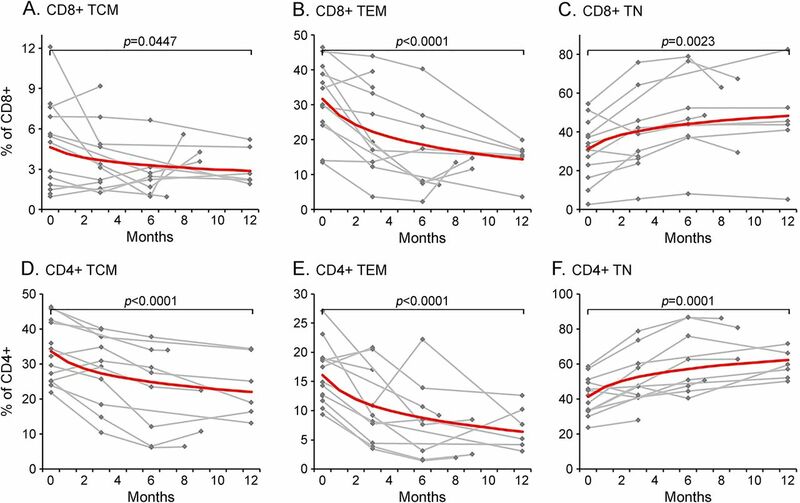 These common trajectories suggested that although DMF treatment results in greater losses of CD8+ compared with CD4+ T cells, a shared mechanism may underlie both subset losses. We considered whether apoptotic cell death may represent such a common mechanism because FAEs have been shown to induce apoptosis in a number of cell types.4,9,23,24 Assessment of the in vitro effects of both MMF and DMF on human T-cell subset survival and apoptotic cell death within PBMC demonstrated that exposure to DMF (but not MMF) induced dose-dependent apoptotic T-cell losses. Although early work with FAEs suggested that the only active metabolite was MMF (with DMF rapidly converting to MMF in vivo),25 our findings are consistent with multiple studies that have since attributed important biological activities also to DMF.4,9,24,26 A degree of systemic penetrance of DMF has been reported, with DMF-glutathione conjugates being measureable in the plasma and brain of rats following oral administration of DMF,27 and similar DMF-derived conjugates found in the urine of DMF-treated psoriasis patients.28 Since Michell-Robinson et al.9 recently reported that DMF can be cytotoxic to human monocytes, we assessed the effects of DMF on purified T cells and documented that the dose-dependent induction of T-cell apoptosis could occur as a direct effect, rather than reflecting an indirect effect mediated by myeloid cells within the PBMC. We considered whether in vivo treatment with DMF might render circulating T cells more susceptible to apoptosis, although found no significant differences between the degree of dexamethasone-induced T-cell apoptosis comparing pre- and post-DMF treatment samples across a range of dexamethasone concentrations (figure e-4). This suggests that the T cells that continue to circulate in DMF-treated patients are not more susceptible to apoptosis, rather they represent surviving cells that may have been relatively less sensitive to DMF-induced cell death (i.e., relatively treatment resistant). Differences in the balance and timing of expression of pro-apoptotic and antiapoptotic molecules have also been implicated in differential susceptibilities to apoptosis.29,31 When examining circulating T-cell expression levels of such apoptosis-related molecules' pre- and post-DMF treatment, we found no significant changes in the pro-apoptotic molecules BIM, PUMA, BAX or BAK, although noted a marginal increase in their expression of the antiapoptotic molecule BCL-2 (table e-2). This would be consistent with the possibility that the T cells that remain in the circulation in DMF-treated patients are less susceptible to in vivo DMF-induced apoptotic cell death. 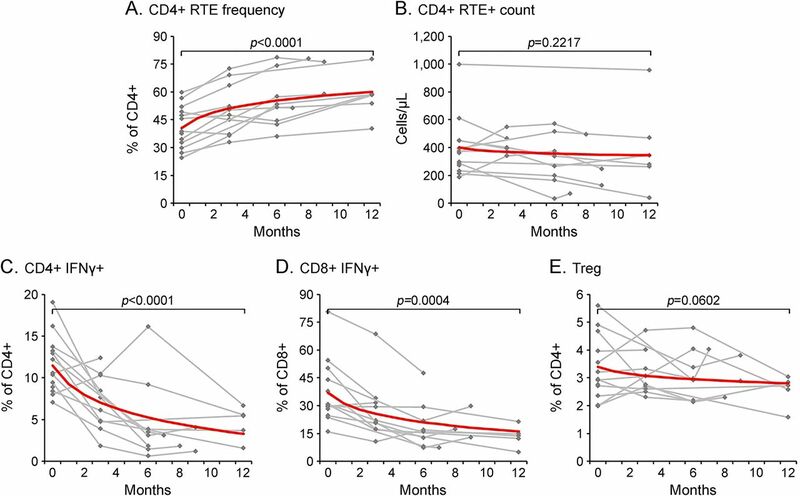 To assess the compensatory response to DMF-induced lymphopenia, we examined the kinetics of emergence of CD4+ RTEs into the circulation of treated patients. Although RTE frequencies appeared to increase during treatment, their absolute counts in fact remained relatively stable. This suggests that, on one hand, DMF treatment does not entirely abrogate the generation and release of RTEs, but that the numbers of released RTEs are nonetheless insufficient to replete the DMF-induced losses of T cells during 12 months of treatment. The relevance of understanding mechanisms underlying DMF-induced lymphopenia is underscored by recent reports of PML developing as a rare complication of DMF treatment in patients with MS.17,18 Such occurrences of DMF-associated PML in both patients with MS and psoriasis have been associated with severe lymphopenia, typically defined as TLC <500 cells/mm3, which occurs in only ∼5% of treated patients. Although particular mechanisms underlying DMF-induced lymphopenia may be common in all treated patients, additional features likely underlie the particularly severe lymphopenia experienced by a small proportion of patients, which would not be captured in this study and merit further investigation. Lesser grades of lymphopenia remain important, however, as highlighted by the recent report19 of PML in a DMF-treated psoriasis patient with a documented TLC nadir of only 792 cells/mm. This raises the possibility that subset-specific losses, such as the disproportionate losses of CD8+ T cells or possibly of memory T-cell subsets as observed in our study and recently by Longbrake et al.,15 may be more importanat to monitor than global lymphopenia. Given the important and opposing roles ascribed to effector T cells and regulatory T cells in the pathogenesis of MS, we investigated whether DMF may differentially affect these subsets, both in vivo and in vitro. We found regulatory T cells to be more resistant to apoptosis following DMF exposure in vitro compared with conventional T cells and found correspondingly greater losses of proinflammatory cytokine–expressing effector T cells vs regulatory T cells in vivo, in keeping with a recent study reporting that the ratio of Tregs to chemokine-defined Th1 and Th17 populations was increased in DMF-treated patients.16 Our results raise the possibility that differential susceptibility to apoptosis, and the resultant change in the balance between regulatory and effector cells in patients, may contribute to the therapeutic mode of action of DMF in MS.
We propose that differential susceptibility of distinct T-cell subsets to DMF-induced apoptosis may contribute to both the efficacy and safety profiles of DMF in patients with MS. Although such a mechanism need not exclude previously implicated modes of action of DMF,3,–,11 it will be interesting to observe whether future studies monitoring distinct T-cell subsets (rather than just TLCs) will provide more meaningful insights into both the safety and efficacy of DMF treatment. M.G., A.R., and R.L. contributed to the design of the study, analysis and interpretation of the data, and drafting and revising of the manuscript for intellectual content. A.E. contributed to analysis and interpretation of the data and drafting and revising of the manuscript for intellectual content. F.L. and F.Z. contributed to the design of the study and revising of the manuscript for intellectual content. P.S.G., J.A., and A.B.-O. contributed to the design of the study, analysis and interpretation of the data, and drafting and revising of the manuscript for intellectual content. M. Ghadiri received travel funding from Genzyme, BioCSL, Biogen Idec, and Novartis; received fellowship funding and a scholarship from Novartis; and received research support from the University of Sydney. A. Rezk and R. Li report no disclosures. A. Evans is employed by Taylor Fry Consulting Actuaries. F. Luessi served on the scientific advisory board for Roche Pharma and received travel grants from Teva Pharma and Merck Serono. F. Zipp received travel funding from Teva, Novartis, Merck Serono, Bayer, Biogen Idec, Ono, Genzyme, Sanofi-Aventis, and Octapharma; has consulted for Teva, Merck Serono, Novartis, Bayer HealthCare, Biogen Idec Germany, Ono, Genzyme, Sanofi-Aventis, and Octapharma; and received research support from DFG, BMBF KKNMS, PCORI PRAG-MS, Progressive MS Alliance, Teva, Novartis, Merck Serono, and Bayer. P.S. Giacomini served on the scientific advisory board for Allergan, Bayer HealthCare, Biogen Idec, EMD Serono, Genzyme, Merz, Novartis, Roche, and Teva Neuroscience; received travel funding from Bayer, Biogen Idec, EMD Serono, Genzyme, Novartis, and Teva Neuroscience; has consulted for Allergan, Bayer HealthCare, Biogen Idec, EMD Serono, Genzmye, Merz, Novartis, Roche, and Teva Neuroscience; and received research support form Biogen Idec and Teva Neuroscience. J.P. Antel served on the scientific advisory board for Sanofi-Aventis, Biogen Idec, Genzyme, Novartis, and Celgene; received travel funding and/or speaker honoraria from Novartis, Biogen Idec, and Celegene; served as editor for the Americas Multiple Sclerosis Journal; served on the editorial board for the Journal of Neuroimmunology and the Journal of Neuroscience Research; received publishing royalties from Oxford University Press; consulted for Novartis, Biogen Idec, Sanofi-Aventis, and Celgene; and received research support from Novartis, Revalesio, Mallinckrodt, Multiple Sclerosis Society of Canada Medical Research Council–Great Britain. A. Bar-Or served on the scientific advisory board for DioGenix, Receptos-Celgene, Roche/Genentech, Novartis, GSK, Guthy Jackson Greater Good Foundation, and Immune Tolerance Network; received travel funding and/or speaker honoraria from Receptos-Celgene, Roche/Genentech, Novartis, Sanofi-Genzyme, and GSK; served on the editorial board for Neurology and Clinical and Experimental Neuroimmunology; consulted for DioGenix, Receptos-Celgene, Roche/Genentech, Novartis, Sanofi-Genzyme, and GSK; and received research support from Novartis and Genzyme-Sanofi. Go to Neurology.org/nn for full disclosure forms. The authors acknowledge Camille Stegen for her management of the McGill University Department of Microbiology and Immunology flow cytometry facility. They thank all the patients who donated blood for this study. Accepted in final form January 30, 2017.
. Selective stimulation of T helper 2 cytokine responses by the anti-psoriasis agent monomethylfumarate. Eur J Immunol 1996;26:2067–2074.
. Inhibition of dendritic cell differentiation by fumaric acid esters. J Invest Dermatol 2001;116:203–208.
. Dimethylfumarate induces immunosuppression via glutathione depletion and subsequent induction of heme oxygenase 1. J Invest Dermatol 2007;127:835–845.
. Fumarates improve psoriasis and multiple sclerosis by inducing type II dendritic cells. J Exp Med 2011;208:2291–2303.
. Fumaric acid esters exert neuroprotective effects in neuroinflammation via activation of the Nrf2 antioxidant pathway. Brain 2011;134:678–692.
. Dimethyl fumarate treatment induces adaptive and innate immune modulation independent of Nrf2. Proc Natl Acad Sci USA 2016;113:4777–4782.
. Effects of fumarates on circulating and CNS myeloid cells in multiple sclerosis. Ann Clin Transl Neurol 2016;3:27–41.
. In vivo and in vitro effects of multiple sclerosis immunomodulatory therapeutics on glutamatergic excitotoxicity. J Neurochem 2016;136:971–980.
. Hydroxycarboxylic acid receptor 2 mediates dimethyl fumarate's protective effect in EAE. J Clin Invest 2014;124:2188–2192.
. Fumaric acid and its esters: an emerging treatment for multiple sclerosis. Curr Neuropharmacol 2009;7:60–64.
. Dimethyl fumarate in relapsing-remitting multiple sclerosis: rationale, mechanisms of action, pharmacokinetics, efficacy and safety. Expert Rev Neurother 2015;15:339–346.
. Reduction of CD8+ T lymphocytes in multiple sclerosis patients treated with dimethyl fumarate. Neurol Neuroimmunol Neuroinflamm 2015;2:e76. doi: 10.1212/NXI.0000000000000076.
. Dimethyl fumarate selectively reduces memory T cells in multiple sclerosis patients. Mult Scler 2016;22:1061–1070.
. Dimethyl fumarate treatment alters circulating T helper cell subsets in multiple sclerosis. Neurol Neuroimmunol Neuroinflamm 2016;3:e183. doi: 10.1212/NXI.0000000000000183.
. PML in a patient without severe lymphocytopenia receiving dimethyl fumarate. N Engl J Med 2015;372:1474–1476.
. Dimethylfumarate for psoriasis: more than a dietary curiosity. Trends Mol Med 2005;11:43–48.
. Intracellular cytokine optimization and standard operating procedure. Nat Protoc 2006;1:1507–1516.
. Repeated measures data. In: Applied Mixed Models in Medicine, 3rd ed. Hoboken, NJ: Wiley; 2015.
. Originalarbeiten-Dimethylfumarate is the Fumaderm (R)-compound with the strongest induction of apoptosis-phenomena in lympho-histiocytic U-937 cells. Zeitschrift fur Hautkrankheiten 2000;75:347–351.
. Dimethylfumarate is a potent inducer of apoptosis in human T cells. J Invest Dermatol 2003;121:1383–1388.
. In vitro pharmacokinetics of anti-psoriatic fumaric acid esters. BMC Pharmacol 2004;4:22.
. The antipsoriatic agent dimethylfumarate immunomodulates T-cell cytokine secretion and inhibits cytokines of the psoriatic cytokine network. Br J Dermatol 1998;139:390–395.
. Dimethyl fumarate alters microglia phenotype and protects neurons against proinflammatory toxic microenvironments. J Neuroimmunol 2016;299:35–44.
. Detection of metabolites of fumaric acid esters in human urine: implications for their mode of action. J Invest Dermatol 2009;129:231–234.
. Susceptibility of naive and subsets of memory T cells to apoptosis via multiple signaling pathways. Autoimmun Rev 2007;6:476–481.
. Differential effect of human herpesvirus 6A on cell division and apoptosis among naive and central and effector memory CD4+ and CD8+ t-cell subsets. J Virol 2009;83:5442–5450.
. The dual functions of Fas ligand in the regulation of peripheral CD8(+) and CD4(+) T cells. Proc Natl Acad Sci USA 2000;97:1707–1712.
. Rapid turnover of effector−memory CD4(+) T cells in healthy humans. J Exp Med 2004;200:255.
. The antipsoriatic agent monomethylfumarate has antiproliferative, prodifferentiative, and anti-inflammatory effects on keratinocytes. J Pharmacol Exp Ther 2014;352:90.